At Valeria Fine Jewelry, we spend our days assisting men and women selecting the rings that will come to symbolize their love and commitment. Luckily, we create custom jewelry, so we get to design rings that capture their individual styles and personalities. It is just so much more fun that way. Why settle for a ring that 1000’s of women can have? The rings above are one of our floral Custom Engagement Ring designs. Simple and elegant, it is a beautiful engagement ring for flower lovers. We think it would look great with a colored gemstone as well. The center stone is tension set by the petals, making for a dramatic effect and eliminating pointy prongs. We are in the forefront of jewelers that see engagement and wedding ring trends as they emerge. At Valeria Fine Jewelry, we create jewelry that people want, but can’t find at the retail stores. So we are the first to see new styles and shifts in consumer demands. As they do, we pounce on them, creating custom engagement and wedding rings that wow everybody who sees them. That is not to say that we copy the styles, although we can. Once we recognize a demand, we put our own twist on it. This Cathedral Engagement Ring is different from others in that the stones are mounted an an angle and not perpendicular to the ring. It also accented with a band going around the ring with a stone beneath it. When searching Google for a Custom Engagement Ring you will no doubt find all of the big box jewelry stores as well as numerous expensive mall shops. However, these shops aren’t really custom jewelers. Most will offer to engrave your ring and call it custom. That isn’t custom jewelry. The rest will make a custom engagement or wedding ring. However, they outsource the job and tack on their mark up for facilitating the job. That ends up costing you more. You need to find someone like Valeria Fine Jewelry who creates custom jewelry in house. Using a go between is much like telephone as a child. A lot can be lost in the relaying off the messages. This can delay projects or even cause the final product to not be what the customer wanted. We keep as few hands as possible in the pot! These types of jewelry stores all have ridiculous overhead that eventually finds its way into the price. You are paying for their employees to sit in a nice store doing nothing all day. Additionally, most of the jewelry found in these locations are not one-of-a-kind pieces. They are mass-produced in Asia and are usually of poorer quality in all phases of manufacturing, yet they still charge an arm and a leg for it. This stunner was created as a blank canvas for our master engraver to fill with his incredible etchings. This Engraved Engagement Ring is shown with an east-west oval center stone, but a round stone would also work. The 18 accents total 3/8 of a carat. This includes 2 bezel set stones under the center stone. Then, there are the shops with sponsored ads, people who pay top dollar have their site at the top of a relevant search. These ads aren’t cheap. And while you can find good custom jewelers through paid ads, that advertising cost will find its way into the price. We only spend money on adwords during Christmas. The rest of are google rankings are organic. This Swirling Halo Engagement Ring is a unique halo design you won’t find in the chain stores. It is perfect for a smaller center stone. The shanks wrap up and around the ring, eventually becoming a sort of double halo. The makes for an elegant effect as the shanks wrap around the center stone and each other. It accented with over 100, 1.3mm stones that total over 1 carat. This ring could actually be worn as a cocktail ring, especially if it was made with colored gemstones. Valeria Custom Jewelry will sell the mass manufactured pieces if that is what is desired, but we thrive in creating new, unique, one of a kind Custom Engagement Ring designs at prices at or less than retail. We love to create Custom pendants, custom hip hop jewelry, custom wedding rings, custom pins, and custom hip hop pendants. Basically, if you can wear it, and it is made of precious metals and gemstones, we can make it. Like most of our designs, this Split Shank Modern Engagement Ring is an elegant one you won’t find anywhere else. 2 of the prongs are formed by the shank and the other two appear out of nowhere for a dramatic effect. It accented with 56, 1.3mm stones that total a little over 1/2 carat. Custom Engagement Ring – Not Just for Wealthy People! All of our custom jewelry can be changed to your taste and usually for less than something comparable at a mall store. We import the stones used in your Custom Engagement Ring stones from overseas, where they are cut, ensuring the best price and value. We also have a small office and both of these things find their way into our prices. To view all of our Custom Engagement Ring designs, click HERE. The 2 stone Custom Engagement Ring to the right takes a traditional accented engagement ring and adds a second stone to it. It isn’t much, but it makes it your Custom Engagement Ring when we do something at your request. Do you turn left when your friends go right? Are trends not important to you? Do you march to the beat of a different beat? If so, you’ll appreciate jewelry that’s not available to everyone and that makes you a candidate for a Custom Engagement Ring. Unfortunately for you, but fortunately for us, the engagement and wedding rings available at retail stores leave much to be desired in the way of individuality. That is where we come in! This Modern Cathedral Engagement Ring is a unique spin on the cathedral engagement ring. There are 2 rows of diamonds on the opposite sides of the band, which is a little cool, but then those rows are interrupted by swooping lines of stones that go up the sides of the cathedral. It is a very dramatic effect. We think it might be cool to have the stones on the “swoops” be a colored gemstone. Bus that is just us! The same is true if you’ve searched the chain jewelry stores and websites and with no luck finding a gift for that truly special someone — something that represents your unique relationship. It’s also entirely possible you are the special someone — and can’t find the right piece that represents your unique style. If that is the case, then a Custom Engagement Ring might be right for you. 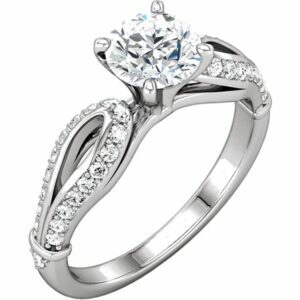 This our 6 prong modern engagement ring set. We decided to take the regular channel set stones and graduate them. That is nothing new, but where we set the stones was. At Valeria Fine Jewelry, we thrive on creating Custom Engagement Ring designs that nobody else can or will make. We don’t care if only a few or even 1 person will want the design….we would love to make it! In fact, the fewer we make of one ring design the better. It’s important to understand the difference between customized and custom jewelry. If you engrave someone’s name or “build” a piece of jewelry from a list of options, you will end up with a personalized, meaningful and beautiful piece of customized jewelry. A Custom Engagement Ring is very different. This is one of our Sculptural Solitaire Engagement Ring designs. This is the type of bypass ring that we just love. The shank is a wave of motion as it travels from one of the ring to the opposite end. The 6 prong basket securely holds even the largest stone intact. Custom Engagement Ring – Give Us A Chance! Custom Engagement Ring design is usually created from scratch. A Custom Engagement Ring is a good option when you can’t find exactly what you want like an updated version of your grandmother’s now-lost 1920’s platinum earrings. No theme or topic is off limits for us when thinking about Custom Engagement Ring designs. Nature, video games, and superheroes are all fair game for us. Our Octopus Engagement Ring looks as if it just jumped from the ocean! It can be made with both a bezel set cabochon center stone or a prongs set, faceted stone. A Custom Engagement Ring may be similar to something you saw online, but with a simpler design for a fake finger. Or perhaps it’s just a memory of a ring you saw somewhere. You also might have diamonds or gemstones from a ring you want to turn into another piece of jewelry that represents you. Regardless of the reason behind the vision, a Custom Engagement Ring is an extreme expression of love. Your loved one took the time to understand the you in a meaningful way and acted on it. And it will show in the final result. it will also show in her reaction to the ring when you give it to her. Click HERE to learn more about custom jewelry, view our portfolio, or to contact us about a Custom Engagement Ring. It can cost less than you think to have your very own custom engagement ring made just for you. Why settle for the lame and overpriced bridal rings from the retail stores when we can make something showing your style and personality? This Custom Engagement Ring was created for a Spessartite Garnet and accented with 1.3mm diamonds on one side of the crossover shank. We think a Ruby or Tanzanite center stone would also be stunning in in this ring. We know there are a few good options when shopping for a Custom Engagement Ring. There are also a lot of terrible options out there. We hope that if you found us, you will at least give us a shot and talk to us. We are quite sure we offer the best combination of service, expertise, and value around. Just google us…evidence of our happy customers are all over the internet.